On the 11th of November 1918, 11:11 AM Paris time, the so-called "war to end all wars" ended. The same date and time in the Year 2018 mark 100 years since the Armistice. This virtual model of a Mark IV tank is my way of commemorating this occasion, as well as the lives of the millions of people who lived, fought and died during the First World War. 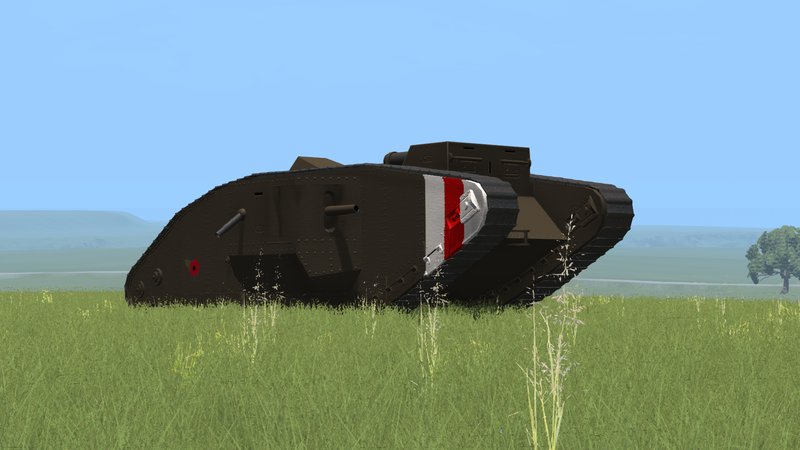 The Mark Four Heavy Tank was part of a family of British armoured fighting vehicles entering service in 1916 with the Mark One. First used during the Somme Offensive, the tank as a concept proved its worth on the battlefield. In 1917, the Battle of Cambrai saw the first mass use of the Mark Four, with over 400 vehicles taking part in the melee. Tanks have been a mainstay of warfare ever since. - Functional slidenode-based tracks based on a concept by Mythbuster and also employed on the Simple Tank. Nice, thank you for remembering and posting this mod! Please for the love of god make it faster. I realize its realistic but i cant really have fun with the thing if its going that slow. I don't understand why is the second gear needed because it just makes it even slower. Id love to give it 5 stars but its a bit frustrating when you want to go to point A to B and can watch a YouTube video while doing it when it takes mere seconds for a Covet. (Doesn't need to be very fast, maybe like a bus' speed? a city bus maybe?) My suggestion would be Adding the option of a different engine. one that is more powerful and could make it go faster for fun not realism. Then you don't understand the point of the mod. If you don't find the characteristics of this tank "fun" then don't use it. Simple as that. Don't whine at the creator to add an unrealistic, unauthentic and just plain stupid feature. City bus speeds? Are you having me on? Thank you for this commemoration. the fact you put so much time into a recreation of such a monumental occasion is astonishing. Im glad others recognize the importance of WW1, and have not forgotten it and all of the lost lives. Hello! I really like this mod. Could you maybe make a modern tank?